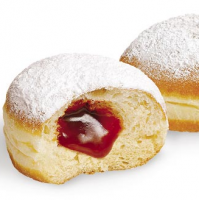 Rich, buttery fried dough with notes of spakling sugar crystals, vanilla and strawberry jam filling. A delicious Jam Donut / Doughnut! Performance in CP Soap: not yet tested. Please note: The above information is provided as a guideline only and results may vary according to individual recipes.